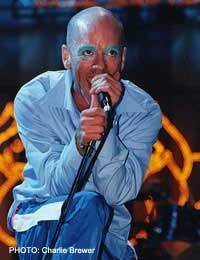 REM are quite possibly the biggest rock band to come out of America in the 1980s, developing into a huge stadium act through the 1990s and into the present day. From humble beginnings in Athens, Georgia, they built an audience with releases on the small IRS label before graduating to a major and climbing rapidly to superstar status. Oddly, for all they’re widely praised and the influence they’ve had on so many musicians who’ve followed them, as well as having a large, avid number of fans, they’re not big in the memorabilia market. About the only possible reason for this can be that they’re still (in memorabilia terms) a “young” band, with many years ahead of them. What this means, almost inevitably, is that prices will rise, although that’s still quite a long way down the line. For anyone interested in a long-term investment, REM represent a good bet with prices still low. One item that’s surprisingly not in common circulation is autographs. They come up periodically, but not with the regularity one might expect. That a guitar, signed by two members of the band, was being offered on eBay with a starting price of £75, was something of a shock. When you do find autographs, though, take the time to read the description thoroughly – some of those offered are pre-printed and so without any value at all – it’s really just an elaborate colour copy of the original. REM have run a fan club for many years, producing items exclusively for members, such as tee shirts. They do have some value, although mostly to collectors. That said, if you can get your hands on some of this merchandise, like the torchlight from the 1980s, you might be able to make a little (but never a lot) on them in the future. Concert programmes will run in the region of £8, but unless you’re a fan collecting them all, there’s not much point to buying them, or even the backstage passes and laminates that come up for sale. Of a little more interest are the record company promotional items that accompanied CD releases by the group, ranging from a bag of peanuts (!) – only £25 – to bop bags (£50) and special Viewmaster Viewers (£25-35). REM have sold a lot of records in the 20+ years they’ve been recording, and that means a lot of awards. Dealers have a number of them, ranging from gold to platinum, and you’ll pay anywhere from £400 to £700, the latter quite a steal for a special RIAA award celebrating sales over four million for the Monster album. The prices are completely in line with most other artists from the period, and possibly represent the best memorabilia investment currently available. What’s really worth hunting for is one of Peter Buck’s guitars (especially his Epiphone 12-string, for instance). They haven’t really turned up at auction, but for the moment might well be cheap enough to warrant buying for future sale. Even better, but much harder to find, would be handwritten lyrics by Michael Stipe. Like other big groups from the 1980s and 90s, REM are currently in memorabilia limbo. They’re too big for eBay, in most instances, but they don’t yet warrant the attention of the big auction houses. Dealer prices might be a little inflated, but they’re still far less than items are likely to sell for in the future.